Entdecken Sie auf dieser zweitägigen Tour ab Melbourne die erstaunliche australische Tierwelt und die natürliche Schönheit zweier beliebter Reiseziele in Victoria. Lernen Sie auf Phillip Island Kängurus, Koalas und andere einheimische Arten aus nächster Nähe kennen, besichtigen Sie eine Farm, die zum Kulturerbe gehört, und beobachten Sie die berühmte Pinguinparade. Fahren Sie am nächsten Tag zum Wilsons Promontory National Park zu spektakulären Wanderungen und Buschwanderungen, darunter ein Spaziergang entlang des treffend benannten Squeaky Beach. Übernachtung, zwei Mahlzeiten, alle Parkgebühren und geführter Transport sind inbegriffen. Kehren Sie mit einer zweitägigen Tour durch Phillip Island und Wilsons Promontory zurück in die Natur - zwei der beliebtesten Ziele in Victoria für Begegnungen mit Wildtieren und landschaftlicher Schönheit. 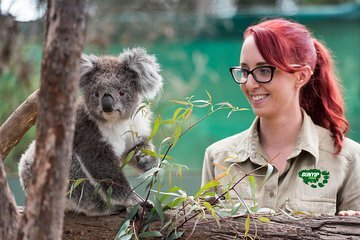 Von Melbourne aus fahren Sie nach Süden zur Phillip Island, wo Sie das Moonlit Sanctuary und das Koala Conservation Center besuchen. Treten Sie auf einer historischen Farm auf Churchill Island in die Vergangenheit zurück und beobachten Sie die nächtliche Penguin Parade, während Hunderte von kleinen Pinguinen aus dem Meer auftauchen und sich in ihre Höhlen begeben. Am zweiten Tag erkunden Sie den natürlichen Spielplatz im Wilson Promontory National Park bei einer Reihe von Buschwanderungen, Wanderwegen und Spaziergängen am Meer. Ausführliche Informationen zu Tour und Unterkunft finden Sie unten. Two great days! Except the Sunday morning: we've been picked up from the hostel then dropt to a bus stop in the middle of nowhere to wait our group. We had to wait 1h... At least we could have been dropt to a cafe !! The first day was good. The accomodations were ok, it was a youth hostel, however we had a private room with ensuite. The second day was a bust. Our tour guide the first day was excellent, very professional and organized. The tour guide the second day was annoying and very unprofessional. Would not recommend this tour. Excellent tour, enjoyed both days. Highlights were the tour guide Natalie's knowledegable insights into the area, visiting the moonlit sanctuary and koala conservation centre. The penguin parade didn't let us down either. Stayed overnight at YHA - clean, tidy, breakfast basic. The next day was Wilson's Promontory - spectacular views and stunning beaches. Only criticism was no stop on the way back to Melbourne - it was 3 hour journey, could have benefited from a break. Tip: if doing the 2 day tour as we did, take enough food for snacks as only lunch on day 1 and breakfast day 2 was included. There was quite a nice balance between the two days. On the first day, we did touristy things like visiting a heritage farm, the nobbies, and the penguin parade. It was fairly tame and I think it's good for those travelling with family. On the second day, we did a lot of trekking and sight seeing at Wilsons Promontory. This was the one that was physically strenuous. I would say it's perfect for those who are physically fit. Not an easy trek, but the views more than justify the effort! Excellent and a very well priced tour that enables tourist to access really diverse and interesting parts of Victoria. Don't expect to see heaps of wildlife as depends on weather and season but those I did see were a delight. Tour guides knowledgeable and enthusiastic. The overnight if at YHA on Philip Island - don't expect others on the day tour to stay overnight as the two tours are treated as separate day tours so I had two different groups of people to get to know over the two days. Breakfast at hostel is basic - suggest bring your own fruit juice as only supply cereal, white bread, margarine and milk. I would have liked to have seen some grain bread in the freezer rather than cardboard like white bread. Otherwise, I toroughly enjoyed my two day.